Short on Christmas gifts? Or stocking stuffers? Even if you’re crazy busy like I am, a quick stop at a spice store (or “health food” store that sells in bulk) does the trick. I previously collected a bunch of #760 Weck jars, 2-ounce “mini-molds,” but I could have used the smallest Ball canning jars. I love the proportions of the Weck jars and the rubber ring and metal clip sealing system. These are the largest jars that I use in my spice drawer, and ensure that I don’t overstock and then toss stale herbs and spices. They make great gifts, even if filled only with kernels of the strawberry popcorn we grow in our home garden. Last year, I was very interested in coarse salt seasoned with fennel pollen and dried orange peel. 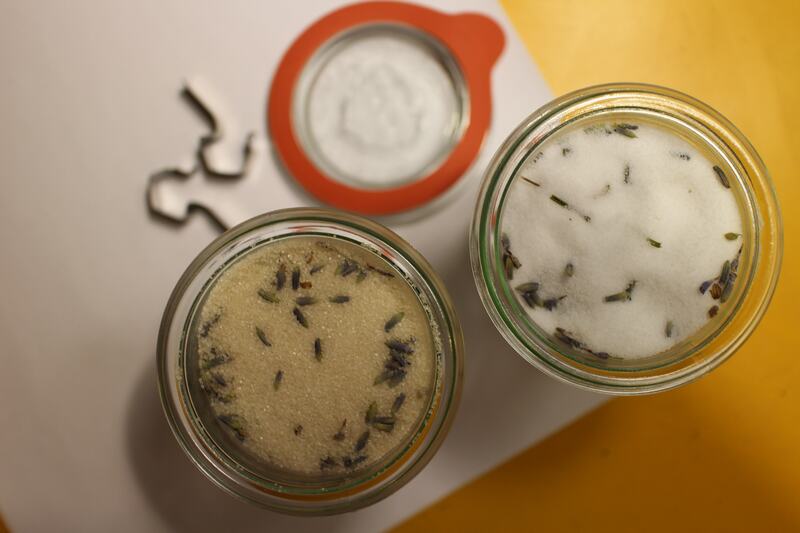 This year, I added dried organic lavender flowers to organic cane sugar and sea salt, all of which are available in bulk from our local organic market. I could have used the lavender that I harvested last summer from our CSA but it looked a little dusty. The proportions are approximate, but to avoid an overdose of lavender that might leave a bitter taste, I used a scant teaspoon of lavender buds to 2/3 cup (2 ounces) of sugar or salt. Unlike vanilla, which takes a while to infuse, this is ready in a matter of days. I use the sugar in syrup, sprinkled on sugar cookies and on poached fruit. Lavender salt will find a similar use, but will probably be used on delicate white fish or scallops. 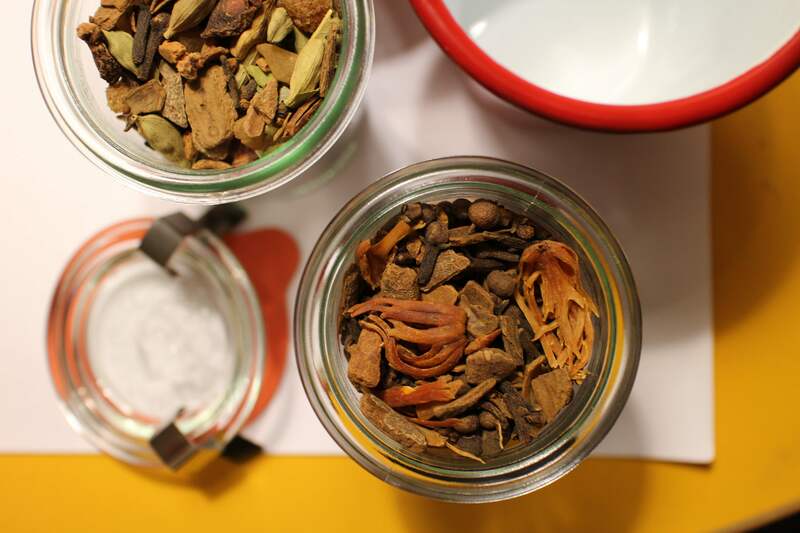 The bulk herb/spice section of the store is a quick resource for mulling spices and a spice mix used in chai. Obviously, you could buy it pre-made, but I like the mix-and-match method. My chai mix included whole allspice berries, chipped cinnamon, cardamom, star anise, cloves, black peppercorns and crystallized ginger in nearly equal amounts and a crushed bay leaf to take the edge off. My mulling spices include orange peel, chipped cinnamon, cloves, allspice berries, a tiny amount of black peppercorns and a hint of star anise. It just so happened that the very cool enameled tumblers that I purchased fit the mini-molds perfectly and will create a great serving piece, all the more authentic since chai is often served in tin cups in India. Have a great holiday. Marmalade and a few other preserves are on their way! Once I catch my breath.